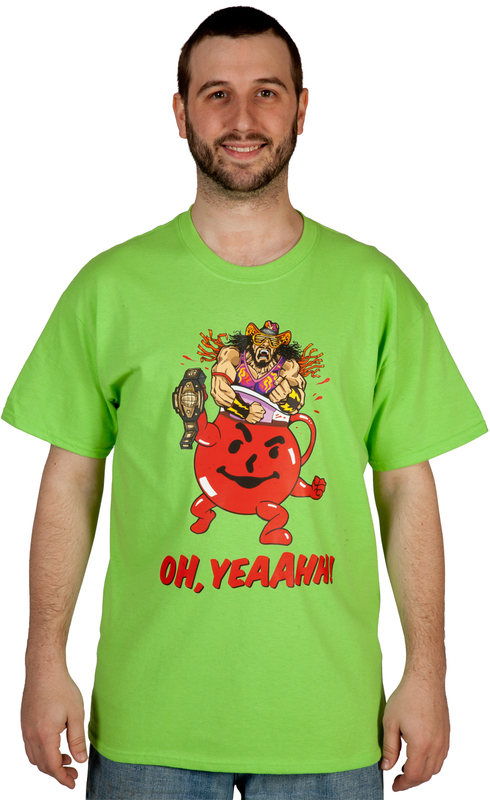 Someone Bought This: Macho Man Randy Savage/Kool-Aid Man "Oh, Yeah!" t-shirt - WrestleCrap - The Very Worst of Pro Wrestling! I simply must have this shirt. OH, YEAH! You can also get it in yellow! 9 Responses to "Someone Bought This: Macho Man Randy Savage/Kool-Aid Man “Oh, Yeah!” t-shirt"
I need that shirt NOW! Yikes, I think even Terry Gilliam would find that image sick. This, the creepy Undertaker mask, naked Michael PS Hayes under the confederate flag…There’s been lots of nightmare fuel at Wrestlecrap this week! My brother’s birthday present last year. I made my sister buy me this for my birthday. Best shirt ever. Shut up and take our money!!! Seems like this needs Slim Jim to be involved. Shut Up and Take Our Money!!!! Greatest graphic print t-shirt of all time. The All New RD and Blade Show!